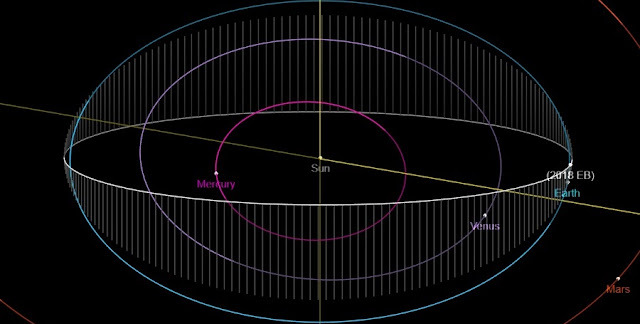 A potentially hazardous asteroid (PHA), estimated to be even 260 meters wide, is expected to pass by the Earth on Sunday, October 7, at around 1:24 UTC. 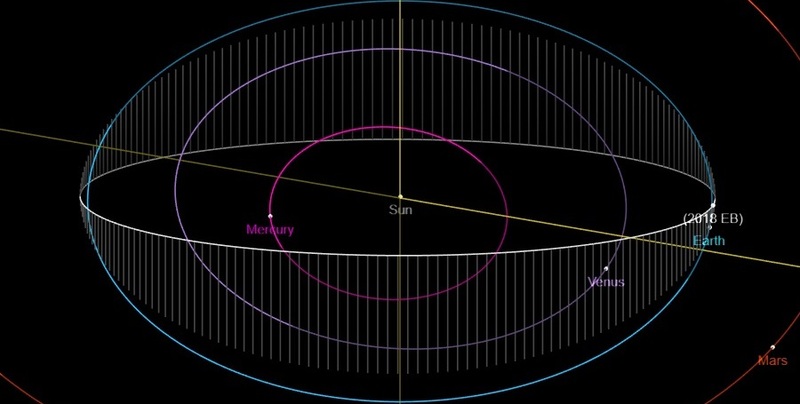 The space rock, designated 2018 EB, will miss our planet with a relative velocity of 15.1 km/s at a safe distance of about 15.4 lunar distances (LD), or 5.9 million kilometers. 2018 EB is an Amor-type asteroid first observed on March 1, 2018 by NASA’s Wide-field Infrared Survey Explorer (WISE). It is a space telescope scanning the entire sky in infrared light, snapping pictures of three-quarters of a billion objects, including remote galaxies, stars and asteroids. In September 2013, WISE was reactivated as NEOWISE, with the primary goal of searching for near-Earth objects (NEOs). According to astronomers, 2018 EB has an estimated diameter between 82 and 260 meters. The object has an absolute magnitude of 21.8, semimajor axis of approximately 1.01 AU and an orbital period of almost 375 days. It takes it about 1.22 hours to fully rotate around its own axis. Next close approach of 2018 EB to Earth is predicted to take place on April 7, 2019, when it will pass by our planet at a distance of about 54 LD (20.7 million kilometers). To date, astronomers have discovered more than 18,800 NEOs. Only this month 169 such objects were detected. On September 30, there were almost 2,000 PHAs detected and none of them is on a collision course with our planet. PHAs are asteroids larger than 100 meters that can come closer to Earth than 19.5 LD (7.5 million kilometers).